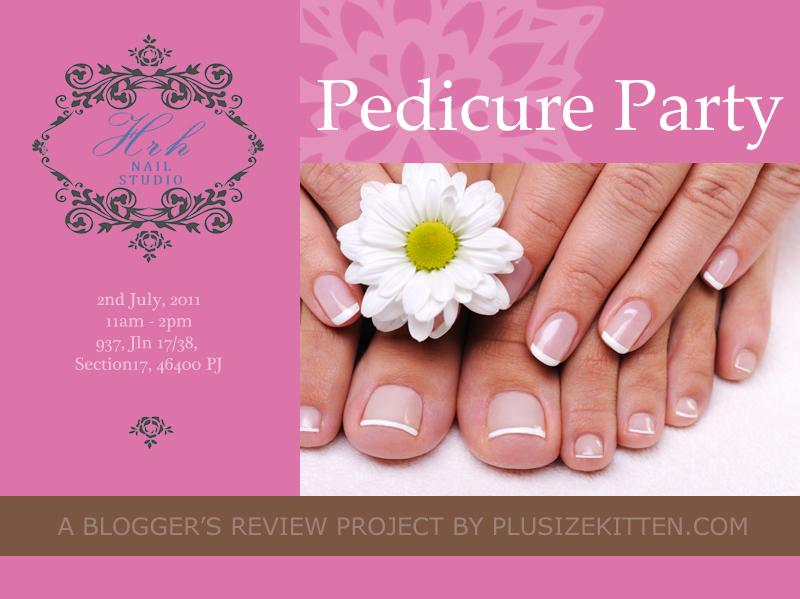 I am so excited because Tammy of Plusizekitten is throwing a Pedicure Party at HRH Nail Studio this Saturday to celebrate her blog's 3 years birthday this June! Happy 3rd birthday Plusizekitten! If you don't know Tammy, you have missed out many good shopping deals and beauty workshops. If you are not her follower yet, do visit her blog and follow her. I am sure you will have interesting events to attend from time to time. I am so glad that I followed her blog 2 years ago even before I started my own blog. Tammy is an inspiration to me. Her passion for shopping never fails to excite her followers. She will be selecting 6 lucky bloggers to join the pedicure party. Since I am a nail enthusiast, I hope she will select me as one of the lucky bloggers. My feet certainly need the extra pampering after a hard week's work. As an amateur nail artist myself, I would be able to appreciate the pampering pedicure and will be able to write an interesting review to feature the service of HRH Nail Studio at Section 17, PJ. Besides the pedicure, the lucky blogger will also be tasting the special pedicure cookies and cupcakes sponsored by Sidney Kan from www.BigBoysOven.com! I have never tried pedicure cookies before and I am very curious about it. I hope Tammy will give me a chance to savour the pedicure cookies and take some photos of the cookies to show all of you. Till then, wish me good luck. Thank you for the wonderful post Lavender, I am happy that I have inspired you during the two years! I have not been actively following workshops or sales this year.. due to my new job. I guess there's going to be a big change now for plusizekitten.com, and change is good. Also I know you're a nail enthusiast, you're definitely going to love this party. I would love for you to come, congratulations Lavender, see u this Saturday 11am! CONGRATULATIONS!! LOL Sounds like you're going!